This is a follow-up post from a March 2018 rock climbing injury where the patient hung by her big toe for 45 straight minutes injuring the soft tissue and nerves. The original thought was sesamoid fracture, but there was not trauma, and the x-rays and MRI proved that they were bi-partite, with the left lateral sesamoid hot enough on MRI to call it stress fracture (probably the stress across the bipartite junction between the two fragments). The general rule I use is that the nerves need 9 months of being good to them to heal or calm down. She started treating the nerves 3 months ago I believe. Happy Holidays! It's so nice to hear from you! I'm doing really well. I'm going to PT twice a week, still using exogen daily, taking 10 mg amitriptyline daily, and I've been able to start wearing Hoka One Bondi and Dansko clogs. These have saved my life. I've been able to return to most of my daily activities. Pain comes and goes but overall is much better. I've seen another orthopedic surgeon and he agrees with everything my sports medicine doctor has been doing to treat nerve pain. He suggested I continue to protect the sesamoid with rigid sole shoes and keep weight off the toe. It was good to get that reassurance in the treatment plan; however, I'm struggling a bit with how far I should be pushing things in PT. Dr. Blake's comment: No need to push things until June 2019 as the thought of you bending too far or jumping on it prematurely scares me. Get stronger all the way up from feet to core. Get cardio with biking and gradually increasing walking up to 2-3 hours in your Hokas. Spica tape when you need to. Experiment with gentle massage 2 times a day up to 3-5 minutes to the area to desensitize as long as it is non-painful. Do neural flossing twice daily, and you can massage with neuro-eze or neuro-one both sold on Amazon. See if they will prescribe Lidoderm patches or a prescription nerve topical gel as long as it is covered by your insurance (they can be expensive if not). Try massage after a warm face cloth is applied under saran wrap to heat the area for 5 minutes. PT has definitely helped and the therapists broke up a lot of scar tissue in the big toe joint that seems to have really helped mobilization of the toe joint. I still tend to get most of my pain in the areas the areas point to below. 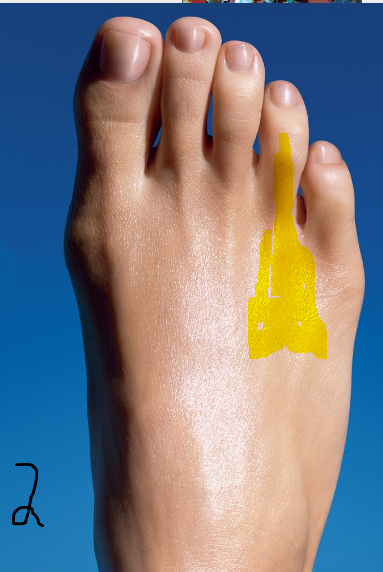 The arrows are pointing to the front of the ligament (called joint capsule) before it attaches to the big toe itself. This is definitely more Turf Toe symptoms. The Physical therapist doesn't know why my pain is here. I'm assuming this is still part of the nerve damage. I still feel a lot of scar tissue too. Could there be another problem related to the scar tissue? Dr. Blake's comment: Yes, the scar tissue from the ligament injury from prolonged tension is the body's way of trying to heal and make itself stronger. Try doing the self mobilization from the video below. Typically scar tissue starts to naturally thin out 9-12 months post injury or surgery anyway. The doctor and the physical therapist want me to get back into more flexible shoes soon and their goal is to get me back to walking barefoot and back to all activity. Ultimately that's my goal too but I don't want to rush it. However, I still don't feel much pain from the actual sesamoid bipartite area. That seems to maybe have stabilized. Dr. Blake's comment: First try barefoot walking on a grass field or shag carpet with the toe spica taped for 15 minutes to see how it feels. Try the OOFOS sandals with the Dr. Jill's dancer's pad to longer and longer periods also. How would you suggest I progress with returning to activity? I'm afraid to upset the sesamoid but if the nerve pain I'm still having could be reduced by starting to flex the joint and start walking. They have suggested I walk in the pool starting chest deep to see how that feels and eventually move to shallower and shallower water. I have not yet tried this but will soon. I've been doing more and more balancing activities which cause pain in the areas pointed out above when my weight shifts there. I tried Tens unit but it seems to aggravate the nerve more so I stopped. Any additional advice you can give would be helpful! This was a response to my blog post. This wonderful patient sent me 2 articles on the use of Shockwave therapy on AVN for sesamoids. I will follow your advices and ask my doc about a CT scan and Vitamin D check. I am attaching 2 articles about the use of shockwave therapy in sesamoid injuries, for sure it will be of interest for you. About the help/use of HBO I did not find any reports in English, but here in Germany you find this information on many medical websites (mainly for AVN in the hip and knee). I had contact with one doc who confirmed that he personally made good experience in treating bone marrow edema and AVN in the foot (ankle and sesamoids) with HBO. The treatment protocol that showed promise was 3 treatments 1 week apart. The treatments were 2500 pulses per session, 2.4 Bar and 13 Hz. 2) Thompson D, Malliaropoulos N, and Padhiar N. Sesamoid Osteonecrosis treated with Radial Extracorporeal Shockwave Therapy. Brit Med Journal Case Report 2017 (accepted 5 May 2017). The treatment protocol that showed promise was 8 sessions, 2000 pulses per session, 1.2 to 1.8 Bar of pressure to patient tolerance, 5 Hz. I am so excited that another help for these sesamoid injuries with avascular necrosis has settled in. I currently have 2 patients that are fine, but any running keeps irritating the sesamoid area with some avn issues. With new techniques, medicine has to find the place for it. When do we offer it to patients, at the first sign of problems, or only after bone stimulator for 9 months? For me now, it is for the few patients (less than 5%) that seem to have issues after extensive treatment and are considering sesamoid removal. But, it may be appropriate much earlier in the treatment. Dr. Blake's comment: This is normal that 20 years after an old injury, the deterioration begins to give us symptoms. I am happy that you got those 20 years of running on apparently great orthotic devices. Kudos to the provider who made them!! I had avoided surgery because I was advised years ago that the surgical options aren’t great (a fact that I’ve confirmed in researching the condition other doctor’s recommendations). About 18 months ago I came across reports of the Cartiva implant, which seemed attractive because of the published high success rate, seemed less invasive than a metal implant like Arthosurface, and because it had been used in Europe for 10 years so I presumed it was a well understood procedure. I got a list of surgeons trained in Cartiva procedure, and saw one who had done it over 50 times, and eventually had the operation in Dec 2017. I had lots of post op swelling and pain, tried physical therapy 7 months after the operation which took care of badly knotted muscles in my foot and ankle, but a follow up x-ray last Oct showed the inplant had subsided into the hallux bone so I had very little space in the joint. I’ve attached a paper I found recently that describes the failure mechanism. Anecdotally it seems that the success rate in America is less than the initial clinical trial paper, and I know the guidance on recovery times and the implant procedure have changed since I had my operation. Dr. Blake's comment: It seems like 10-20% failure rate for implants is normal over a 5 year period. You chose well finding someone with experience at least. I am glad these are being converted to Arthrosurface hemicap so you can avoid fusion for now. I attached the Arthosurface blog and a video of the conversion. The Cartiva does take out very little original bone, so seems perfect (remember I am not a surgeon but I try to be logical) to convert to the Arthrosurface. I do not know why the Cartiva literature does not talk about cheilectomies first or Arthrosurface to try to avoid surgery. But I am happy to learn if someone knows. The orthopedic surgeon who did my Cartiva implant said my only option for revision was a fusion, something I’ve been trying to avoid. There’s a video on youtube that shows an Arthosurface hemicap revision after a failed Cartiva, so I got a list of doctors in my area for an Arthosurface consult. (Just because a procedure has been done once doesn’t mean it’s widely recommended). I went to a podiatrist who does surgery, who turned out to have done both Cartiva and Arthosurface procedure (he didn’t show up when I got a list of doctors certified for Cartiva when I was looking for doctors in 2017). We had a very informative conversation about various options for my toe. First, he said my surgeon had done a good job on my Cartiva procedure (good joint alignment, good scar, etc) He said his experience with Cartiva was not as good as the original clinical results, and the surgical guidance for Cartiva had changed in the past year to leave the implant sticking further out to account for implant subsidence into the bone. He did not recommend an Arthosurface procedure, saying that I’d likely need another procedure in a few years. After talking about fusion for a while, looking at X-rays, he thought I was too limited, and suggested that a Keeler procedure would be a good alternative to fusion with similar long term results. His opinion was that an orthopedic surgeon would favor a fusion as more robust, but that a podiatric surgeon would favor options that preserved natural motion. I’ve found one reference that discussed the Keeler procedure for hallux rigidus and found comparable long term results to fusion, but would welcome your opinion. I’ve found shoe and supplement combinations that limit my discomfort, but I would like to get my toe taken care of sometime in the next few months. Dr. Blake's comment: The Keller procedure removes most of the base of the big toe at the joint. The joint would not hurt and you could use it. The procedure permanently weakens the joint, but orthotics, taping, strengthening, could help. You can not run with your knee anyway. It is not high tech!!! Must be good then!! If you let me know where you live, I can send you a list of sports podiatrists that you can run this by. Interesting!! I sure hope I have helped you. This article states that synthetic cartilage implants have a 10% chance of removal and joint fusion in 2 years, and another 8% more by 5 years. Another article on synthetic cartilage noted excellent results with only 1 of 27 or 4% needing fusion, 2 of the original patients lost to follow up. This article states that it is a viable surgery before fusion is recommended. Our office uses the Hemi-Cap from ArthroSurface. This article shows no conversion to fusion after 3 years. Another excellent article on Hemi-Cap. 13% were revised by 3 years in some way. "At 60 months, all patients reported excellent satisfaction with their current state and would repeat the procedure. Implant survivorship was 87% at 5 years. Of the 30 implants, 4 were revised at 3 years." Here is the revision from Cartiva to ArthroSurface. As so many others I found your blog and I agree that it is one of the most valuable sources about sesamoid problems. Thank you so much for providing it! You are truly one passionate doctor. As many others I am suffering from sesamoid pain and I would be very thankful if you find the time to answer to my message. 45 year old athletic man, working as a professional mountain bike guide in the summer (not riding with cleats!). Office job in winter time. First subtle pain at the ball of the foot started around 1.5 years ago when wearing fancy shoes in the city. Plus some pain on the side of the big toe joint, mostly when pressing on it. First saw a doctor in October 2017 (which is 14 months prior to this dictation). X Rays were done, showed no arthritis in the big toe joint. Doc said it is an inflammation in the joint plus the tendon of the lateral sesamoid. Prescribed Arcoxia pain killers for one week, rest and orthotic insoles with stiff extension + gait analysis. Approx. 4 weeks later I started carefully with cross country skiing again, I cannot remember major pain so I continued sports with only very little discomfort. Dr. Blake's comment: So, this was the beginning of it bothering you, but it was manageable. August 2018 aggravation of pain on the side of the big toe joint and at the ball of the foot when biking and walking. Difficult to walk normally. I began to walk on the side of the foot not trying to bend the big toe. Dr. Blake's comment: I am assuming it was fine, or at least slight between November 17 and August 18. End of September new appointment at doctor, ordered MRI. Diagnosis = the lateral sesamoid has problems with the blood supply. New orthotics and rest prescribed. November 2018: went to 2nd doc. He looked at the MRI and said the lateral sesamoid is „mushy“, dead and damaged (AVN). Very pessimistic, also about surgery. Started shock wave therapy with this doc on Nov 22nd cause I found good case reports about it. Also send MRI to a friend/radiologist who said there is bone marrow edema but no fracture and only maybe AVN and I should try shock waves. Dr. Blake's comment: Yes, conservative management is fine at this stage. I am not qualified to assess shock wave for this however. My read today would be CT scan ASAP to see if you truly have AVN, then Exogen bone stimulator, and contrasts and acupuncture to get the bone healthy over the next year. Weight bearing is crucial for mineralization. Assessment of Vitamin D levels to make sure you are not deficient. Even bone density especially if the Vitamin D is low or low normal. Experiment with Hoka One One shoes, off weighting orthotics, biking shoes with embedded cleats, all in attempt to have you do as much weight bearing while keeping the pain level between 0-2. I am attaching some photos of the MRI. If helpful I am happy to send you the full pictures via wetransfer/dropbox etc. What is your opinion about the condition of the lateral sesamoid? AVN? Fragmented? Or just edema and still in one piece? Dr. Blake's comment: Please send me a disc of the MRI and CT scan when done at 900 Hyde Street, San Francisco, CA, 94109. 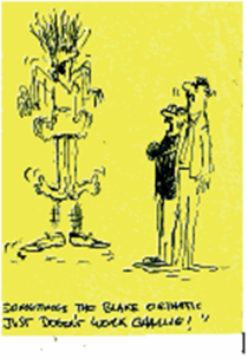 Wear insoles at all times in stiff soled shoes (longer walks 5 mins+ in heavy mountain boots). Will try dancer´s pads. I read your advise not to be barefoot at all, however I have no pain standing barefoot on my foot? It is even more comfortable than in shoes. Dr. Blake's comment: With general rules, you have to see what applies to you. Listen to Your Body and how to attain the 0-2 pain levels. Sound like Barefoot for you is just fine. Contrast baths daily Dr. Blake's comment: Very important to flush out that bone edema. Try twice on weekends. Taping the big toe joint so the joint is stabilized when longer walks are required. Massage the area. Passive stretching of the big toe helps, but I read not to bend the big toe at all? Can I bend it passively? Dr. Blake's comment: This is one of those that has to do only with pain levels. Typically you restrict the toe motion while exercising to limit the pain, and you keep it loose when you are at rest. Thinking about hyperbaric oxygen therapy. Have you any experience with it? Dr. Blake's comment: If you find an article supporting its use in AVN, I will run it by the doctors here that run our HBO program. Make a control MRI in 3-4 month (6-7 month after first one). If no progress to be seen consulting foot surgeons about surgery options. I have heard very contradicting opinions about the surgery. People who are totally happy and returned to sport activities and others who had even more pain. What is your experience? I am afraid about losing my profession and outdoor life. Dr. Blake's comment: The few patients I treat with sesamoid surgery typically are happy with the procedure, so I do not feel bad about recommending it if it comes to that. The failures are from bad luck, bad surgery, inadequate evaluation of what is causing the pain, etc. The inflammation in your MRI is excessive and will distort the viewing of the bone and the decision making. I would get a CT scan now, start Exogen, contrasts, pain free activities, perhaps acupuncture, get another MRI in 6 months, and probably another CT scan in 12 months. Some of my patients cycle with the weight on the pedal not the ball. See the posts on how to design weight bearing floats for the big toe joint so you can do yoga, Tai Chi, stretches, etc without irritating the sesamoid. Is there anything else you can recommend me? I read you are recommending the bone stimulator, does it make sense in my case? Bioventus Exogen seems to be available here in Germany. Richard thank you so much for your time and hopefully short answer. Of course you can publish this message on your blog. Now I wish you a merry Christmas and hope you will spend it with your family and friends and that you are having a good time! Dr. Blake's comment: Good luck to you my friend!! I hope this helps you. This article shows the complex relationships within our bodies. Here a chronic issue like asthma has been linked to a neurological condition. We really do it know what it means except that there are inter-relationships among disease processes. I am so grateful I found your blog a month ago after suffering strange left foot problems for over a year! In August 2017 I unexpectedly was taking care of my 84 yr old mother-in-law (stroke victim) who lives on 20 acres in the country with the clothes on my back and a pair of cheap flip flops for a week. Of course, I developed Plantar Fasciitis in my left foot - wearing non-supportive shoes all day long! Fast forward, I had 2 visits to my family doctor (who gave me steroid pills, told me to ice 3x daily and do foot exercises), saw a Podiatrist (who saw me 10 minutes, barely touched my foot for $330, gave me an injection and suggested orthotic inserts for $450) and then I saw my Chiropractor, who adjusted my foot, did x-rays (they were normal but I have a heel spur) and made me orthotic inserts for $250. After wearing the Chiro orthotic devices for one month, I developed additional forefoot pain but the heel pain subsided greatly. I removed those inserts because it appeared they were the cause of my forefoot pain. Immediately, the forefoot pain was less, but the heel pain came back strongly within one day of not wearing the inserts. Upon my examination, it appeared the arch was too high in the Chiro orthotic inserts, so I went back to the Podiatrist in June 2018 and got the $450 hard plastic 3/4 custom inserts which had a definite lower arch. I continued to wear the hard custom orthotic inserts and my heel pain completely subsided but the forefoot pain got worse. So I bought a variety of OTC inserts trying to find a solution. I went back to my family doctor who told me I have a mechanical problem, gave me steroid pills and told me to stay off my feet and do contrast therapy. I don't want to keep doing steroids! At that time, I averaged 9 k to 13 k steps a day because I am very active person, so now I have cut back to 6 k-8 k steps daily and try to rest my foot. After reading several sections of your blog, I have determined I have 2nd metatarsal capsulitis, with beginning hammertoes on digits 2, 3, 4 and a definite Bunion, stage 2-3 on my left foot. I have lost strength in my left foot since June 2018. I can barely spread my toes now and the hallux joint seems 'lax' and does poorly with resistance testing when trying to dorsi-flex the toe. I bought shoes with bigger toe boxes. I bought some Yoga toes but I haven't used much since they hurt my smaller toes. I also have Stage 2 bunion on my right foot, but no issues other than my right foot gets overloaded from compensating for the left foot! Dr. Blake's comment: Try cutting off the part of the Yoga Toes to the 4th and 5th toes. Without actually examining me personally, (I live in Texas), can you at least give me general advice on what I am doing currently? I am attaching a picture of my foot and insert. I am taping the second digit and sometimes the third digit per your video instructions. This seems to be helping. I am icing the ball of foot 3 times daily for 15-20 minutes. I am doing the alphabet with my foot and rolling my arch on a tennis ball every morning. I am doing your doming exercise 2-3 times daily (10-12 reps) with both feet and place my sock rolled up between Hallux and 2nd digit space to 'straighten' the toe. I have placed a homemade MT pad using felt from Hobby Lobby taped to my insert (I couldn't find anything in stores - I was desperate to relieve the pain!). Dr. Blake's comment: If you feel better after the icing, continue. If you do not feel better, it may be too long, so reduce the icing to 5-10 minutes. Q 1. I notice that after awhile, I will have pain/cramping in the lateral side of my foot (5th MT) even though the 'pebble sensation' in 2nd MT is reduced greatly by the pad and topside swelling has gone down. Yay! 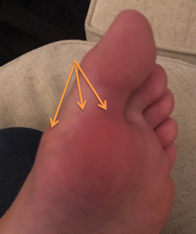 Is this pain caused by 'loading pressure' from the arch in the orthotic support? Or from the MT pad? Or both? It seems like one thing fixes one issue, but then causes another issues. Any Ideas? Solutions? So far I am continuing with the pad and dealing with the lateral pain. Dr. Blake's comment: Yes, probably from orthotic devices, limping, etc. Try to alternate what you have on your foot several times a daily, one being no orthotic devices. Q 2. Is it okay to do the doming exercises while dealing with the capsulitis? Will the doming exercises strengthen my Hallux? Any suggestions for getting back strength in that big toe and all my toes of left foot? I continue to try and spread the toes and I also flex the toes after doing the alphabet. Dr. Blake's comment: As soon as you can do single leg balancing, see the cut out I prescribe for sesamoids so you can do the same idea and float any sore area, you will really start to strengthen your foot and toes. Q 3. I tried the gel toe separators for my bunions - they hurt a lot inside my shoe-seemed too hard/big. Suggestions for alternatives and how important is it that technique for me? Dr. Blake's comment: Not appropriate now while you are dealing with the capsulitis 2nd, too much pressure on the 2nd toe. Q 4. Use the Yoga Toes less time until they don't cause pain in the smaller toes? Dr. Blake's comment: Try my technique for cutting the part that separates the 3rd and 4th toes, and separates the 4th and 5th toes. If still painful, try the less intense Yoga Gems. Thank you again for reading and answering my email. I was going to donate to your blog and when the site asked me my address, it stated something about contacting you regarding your privacy practices about my address. Can you tell me those or where you have them posted so I can donate with comfort? Thank you again. Dr. Blake's comment: Thank you for the gesture. That must be a new Pay Pal privacy rule. Your email is never shared with anyone by me. I am miserable an in need of urgent help. I am a 37 year old female. I fractured my right foot (Jones fracture) on August 24 2018. I was put in a cam boot and after one month started initial weight bearing with the boot and then on the 8 week mark when the x-ray showed that the fracture has healed I was told to get out of the boot and start walking. Several days after I started walking, I developed severe pain on the top of my foot (between the 3rd and 4th metatarsals) that made me limp badly and also on the ball of my foot that I could feel the most when walking barefoot. I went to see a foot and ankle specialist who suspected a stress fracture. He asked for an MRI and an ultrasound and both showed no stress fractures. They also did not show any soft tissue issues, neuroma, etc. Dr. Blake's comment: This would appear then to be nerve irritation since it is never seen on x-ray, ultrasound, or MRI like bone or soft tissue injuries would be seen. The doctor gave me non steroidal anti-inflammatory (600 mg) one pill a day for 20 days and he asked me to rest my foot. This kind of got rid of the dorsal pain but the pain in the ball of my foot remains severe. The pain cannot be felt if I touch my foot neither from the top or if I touch the ball. It is not there when I’m resting either but it shoots up when I walk or bear weight. It is the worst when I walk barefoot and when the foot spreads. I went to see the doctor again and he tested for neuroma but there was no click. He couldn’t figure out what it is but he says he suspects a soft tissue inflammation. He gave me two steroid shots in the areas shown in picture 1 below. He targeted those areas because this is where I thought the pain generates from. It has been a week and the shots did not help at all. I still have severe pain in my foot. Picture two below demonstrates where the general area of my pain is. And as mentioned, it is the worst when the foot spreads. Please help I am very desperate as I have not really been walking since my fracture and I am becoming severely depressed. I was an active person before this and now I cannot even go to the toilet without having severe foot pain. PS. The pain can be coming from above your foot also due to limping for awhile and upsetting the delicate balance of your body. See my video on foot pain from back causes. I have been suffering from this from 9/8/18 and would greatly appreciate any input. I am also happy to travel from NYC to see you if that would be better. so informative— just let me know how to do so. in a CAM boot which I did religiously. After 3 weeks I weaned off for about 3 weeks into an orthotic and was feeling better. on that 3rd week and my symptoms worsened. about taking off a bone I’ve had all my life and retracting a tendon. /podiatry where you immediately lean to surgery and forget conservative care. start physical therapy. I am also taping my foot. would be the same regardless of whatever MRI result I have. make the right decisions. I would vote for an MRI to see what is going on. 3. Marrow edema along the synchondrosis of accessory. straining for a long while and maybe this area was becoming a weak spot to you. The chronic part that will take the most work from you is the tendinosis. should do for a while. 3 months removable boot, 2 month minimum, to obtain the 0-2 pain level consistently. evening. You get an Exogen 5000 bone stim and treat this as a fracture, since it may. 2 sets of 25 level 6 theraband typically over the next 6 months. 1. As of next week, I will be in the CAM boot for 10 weeks. How long do I need to be in the boot? It actually hurts now being in it. 2-6 weeks, based on maintaining the 0-2 pain level. 2. Do I need surgery? have to wear a boot occasionally due to flares? 3. Can I ever run if I do not have surgery? weak spot to some degree going forward. 4. Do custom orthotics matter? I had some moldings done w an pedorthist in NYC. Dr. Blake's comment: Depends on their knowledge with your injury, and what works. device itself. It does not have to be perfect by any means, just thoughtful for you. w accessory navicular syndrome need surgery? feels high to me. The surgery is normally because the tendon is more the problem I think. accessory bone. I think we know at 6 months if someone is going to avoid surgery. surgery if I had given up. 6. How long does it take normally for symptoms to improve? 6 months? 1 year? to put the ducks in a row and maintain 0-2.
enjoyed living in the Sunset area. I was referred to you by Stephen Pribut (podiatrist in the Washington, DC. area). He said you may be able to respond to my questions by email and offer suggestions for a course of action. I am writing to request your opinion on the problems I am having with the fusion of my left big toe. I know this is not an examination but I believe you can address a couple of specific questions I have described below. In May 2017 I had my left big toe fused due to hallux rigidus. Once I started trying to walk, I felt significant pain underneath the last joint of the big toe. There is no pain at the MTP joint. For the last 18 months, I have been trying to determine the cause of the pain with no success. The surgeon says the fusion is okay. In June 2018, I got 2nd opinions. I was told either the angle of the toe was fused too low or the hardware was to blame. I didn't want to redo the fusion so I had the hardware removed. This did not solve the problem. 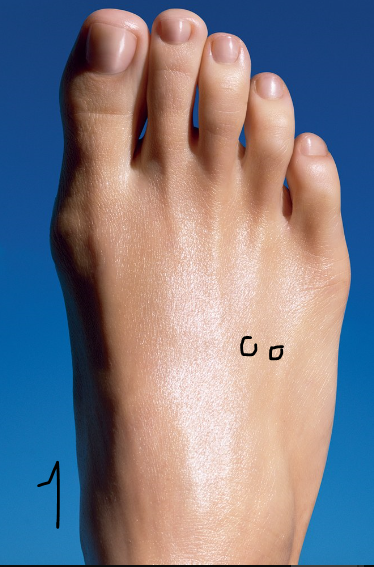 Dr. Blake's comment: This is not uncommon, but a pesty complication where the big toe is not fused high enough so the end of the toe becomes the low point when pushing off and takes all your body weight. You can rebreak and refuse or design orthotics to off weight the point to distribute the force. Most choose the orthotic or padding option. I came across the chapter attached discussing complications of the fusion. My symptoms mirror exactly the situation where the toe was fused too plantarflexed or too low. If you look at the upper of the HOKA rocker shoe I've been wearing, it is evident that my midfoot to the 5th toe is bending over to the outside. Then, as I walk, I pronate and roll over the foot to the inside trying to avoid the end of the toe. I have a large callous on the side of the toe as a result. I have tried but now realize I can not really feel the ball of my foot/MTP joint touch the ground. So, when I toe off, all the force is on the end of the toe. It looks like the xray shown in the chapter - Figure 2A and 2B, p117. 1. I had a gait analysis on November 19, 2018. The graph is in the attachment while other data is copied below. I believe the graph/image supports an over plantarflexion of the left big toe. I know this is not a formal examination but please can you tell me what you see from the graph/image? Dr. Blake's comment: Yes, that is how it looks. I would note my right foot looks more normal to me even though I had some scar tissue excised on the 2nd and 3rd toes just 2 weeks ago. It is little stiff but no pain like I experience with every step with my left foot. 2. Noting the pronation of my left ankle, the physical therapist believes that might be a cause. I have always had some pronation but I have never had pain under my toe until this fusion. I believe the pronation is now exaggerated because the midfoot is rolling to the outside which it never did before. So the ankle has to roll farther to the inside to get me over the toes. The pt suggests a medial wedge. I think this may make the midfoot problem worse. What do you think? Dr. Blake's comment: Yes, a medial wedge will just throw you out and mess everything up from more constant supination. Typically it is a balancing act of some lateral support so not to supinate at all, and some off weight-bearing padding on a full-length orthotic device to take pressure away from the point of pressure in the gait image. He taped the inside of my calf/heel as a test and that caused pain just below the knee on the inside. All the modifications to shoes, orthotics, etc. to avoid the big toe only make foot mechanics worse, not better, in my opinion. Dr. Blake's comment: You are on the right track. You need stability with weight spread out on the big toe, just not on the sore spot. After a fusion, the benefit is to have this stable big toe joint that is not painful and can accept all this weight. At least by theory. So, you want a stable orthotic that loads 90% of the big toe, not off weights the big toe. I would be most grateful for your opinion on these 2 matters. It is looking like I will need to get the fusion redone. I want to make that decision with the benefit of all the information I can obtain. It is difficult when there will be opposing views. My goal is to return to downhill skiing and hiking if I can. Three years ago I was playing tennis too. Now, I can't go for a walk because of the pain in the foot and related hip and lower back issues. Thanking you in advance for your help, Good Luck! !